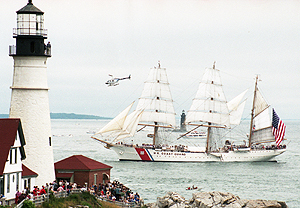 Over the weekend of July 28th to July 31st 2000, the City of Portland, Maine welcomed 23 tall ships as part of Operation Sail’s Op Sail 2000 celebration. Tall ships from around the world sailed into Casco Bay, including ships hailing from numerous U.S. ports, the Ukraine, Argentina and Brazil. The public was offered an opportunity to tour the ships, as well as participate in a series of organized events and entertainment including historical exhibits, musical guests and local cuisine.